Instead of naming their new subdivisions the Dune Cottages, the Ocean Forest Cottages and the Riverside Cottages and then running their Dune Avenue down the Sea Island Spit, where the Loggerhead Turtles nest and 144 species of birds come to rest, making reference to the sea of effluent on which their cottages sit would be more honest, but it wouldn’t attract many new buyers for Sea Island Coastal Properties’ million dollar lots, would it? And it probably wouldn’t please the realtors trying to move the 29 extant mansions in the million dollar plus range. (For anyone looking to pay less for a house on a septic tank there are only four “Affordable Homes.”) Certainly no-one ever mentions the need to accommodate tanks and leach fields under ground as the reason for all those expansive lawns and why sitting on an eight foot “high dune” is a boon, even though a hurricane tide will rise to thirteen. Sand is good for percolation, but an unmentionable. “What people don’t know can’t hurt them,” or so the old saying goes, but there is evidence that the denizens of the marshlands don’t thrive on septage. Marex, the University of Georgia’s Marine Extension Service is even trying to prove it. 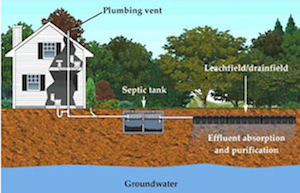 The University of Georgia Marine Extension Service has implemented a Section 319 grant project to conduct a comprehensive environmental regulatory program for officials of local governments and homeowners concerning the relationship between individual OSDS (septic systems) and surface and ground water quality. This program stresses the requirement for protection and prevention of septic contamination, thus calling for periodic inspection and maintenance by home owners. The primary step is to identify and locate existing OSDS and wells, with individual systems being visually inspected by local health department personnel. They’ve made a pretty good start. 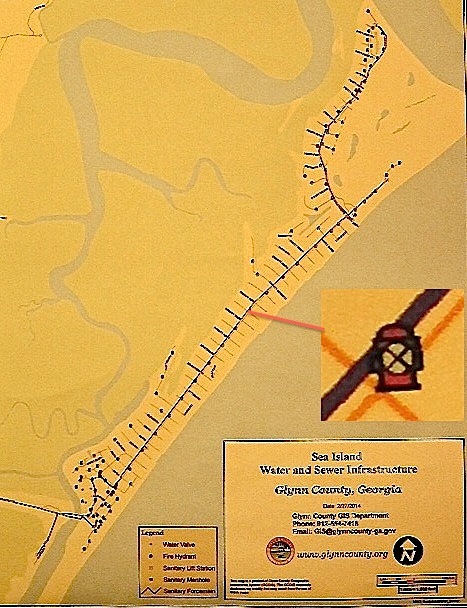 While this partial map of Glynn County, Georgia, locates a major problem in the western part of the County, where various industrial sites also contaminated the ground and waters with waste, the Sea Island tanks aren’t front and center, but they’re also no longer on page 175 of the 228 page Master Plan the consultants prepared for the Water and Sewer Commission five years ago. It was almost as if the recommendations for the immediate coast were to be overlooked, perhaps because the data hadn’t been forthcoming. Based on these results, if the majority of the RD I/I (Rain Derived Inflow and Infiltration) is eliminated from the St. Simons Island gravity sewer collection system, the 4.0 MGD WPCP will have more than sufficient capacity to serve the 2029 needs of St. Simons Island, Sea Island, and Lanier Island, including the majority of the current septic system users. The 0.048 MGD Golden Isles Marina WPCP on Lanier Island should also have sufficient capacity to serve the 2029 needs of Lanier Island. However, if the measured flows at the St. Simons Island WPCP, and therefore RD I/I flows, are considered instead of the estimated sewer generation rates, the per capita sewer generation rate increases and the projected 2029 St. Simons Island average daily sewer flow jumps to 3.80 MGD. It is unlikely that all the RD I/I can be cost effectively removed from the St. Simons Island sanitary sewer system. It is reasonable to assume that at least 25% of the RD I/I flows will not be removed. If 25% of the RD I/I flows remain, the projected 2029 St. Simons Island average daily sewer flow is approximately 3.02 MGD. Table 7.11 presents the total average daily sewer flow for 2029 from the service areas if RD I/I is not eliminated from the system. Essentially, if improvements are not made to the St. Simons Island gravity sewer system to significantly eliminate RD I/I flows, the additional flows from septic systems cannot be absorbed into the sewer collection system without exceeding the 4.0 MGD capacity of the St. Simons Island WPCP. It should be noted that the St. Simons Island flows projected for 2029 which include either the 25% or 100% RD I/I flows are based on the current average RD I/I flows observed at the WPCP. If efforts are not made to improve the gravity sewer system, the piping and manholes will continue to deteriorate and fail and it is likely that the actual future RD I/I flows will be much greater than those presented above. It is in the best interest of the County and the WPCP collection system to continue with the ongoing rehabilitation efforts to eliminate RD I/I from the gravity sewer system. Such efforts will improve the integrity of the sewer system, reduce environmental impacts, and extend the capacity of the WPCP beyond the 20-year planning period. Whether it would truly be in the best interest of the residents of St. Simons Island, where the sewage treatment plant sits, to pay higher rates to exclude rain water from the sewer lines, never mind raising the manholes out of the flood plain, so the denizens of Sea Island can be accommodated whenever they decide to hook on, is debatable. 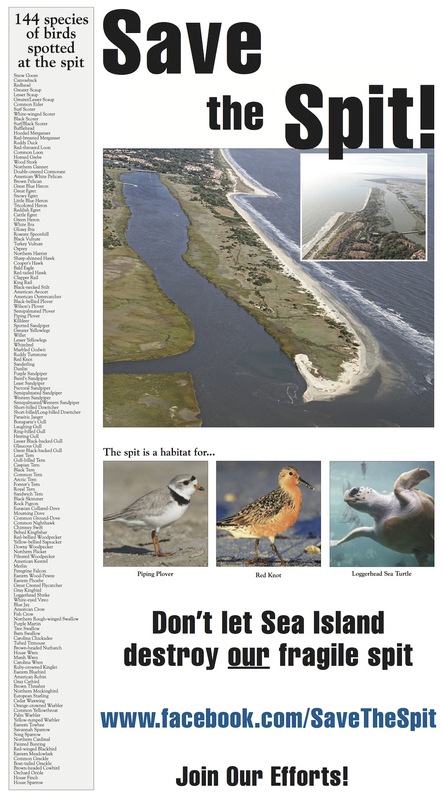 But, perhaps what made the consultants reticent were some of their other assumptions, such as that Sea Island was “built out” and 441 residents were all one could expect needing to be serve. According to the Environmental Health Department, a state entity, btw, even their estimate of 400 septic tanks (OSDS = on-site disposal system) was largely a wild guess. In the event, the whole north end of the island has been carved up into gated enclaves and a golf course in the interim, while the historic Cloister Hotel has been rebuilt and any number of condos plopped down on the south end. And, presumably, the latter are served by the force main, with a single manhole, that’s been run down the island’s spine. Glynn County Community Development GIS was even able to generate a map. Maybe the island should be called “Dog Heaven.” In case it’s not clear, all those dots on the map are fire hydrants — 103 of them, along with one manhole and seven lift stations. Lift stations are holding tanks with pumps that are designed to push the sewage along. But, whether the lift stations on the map are actually in place is hard to tell. At least one of the lots identified in the public records as having a lift station on it has a rather storied record as a McMansion. A notice in the Brunswick News tells quite a lot. NOTICE OF SALE UNDER POWER GEORGIA, GLYNN COUNTY Because of default in the payment of the indebtedness, secured by a Security Deed executed by John L Varner to Mortgage Electronic Registration Systems, Inc. dated July 5, 2007 in the amount of $5,000,000.00, and recorded in Deed Book 2262, Page 31, Glynn County, Georgia Records; as last transferred to TMST Home Loans, Inc. by assignment; the undersigned, TMST Home Loans, Inc. pursuant to said deed and the note thereby secured, has declared the entire amount of said indebtedness due and payable and pursuant to the power of sale contained in said deed, will on the first Tuesday in April, 2010 , during the legal hours of sale, at the Courthouse door in Glynn County, sell at public outcry to the highest bidder for cash, the property described in said deed to-wit: All that certain lot, tract or parcel of land situate, lying and being on Sea Island, Glynn County, Georgia, as described on that certain plat of survey prepared by Robert N. Shupe, Georgia Registered Land Surveyor No. 2224, entitled “Minor subdivision plat of Ocean Cottages at Ocean Forest, Phase Six” dated March 21, 2003, and recorded in Plat Drawer 29, Map No. 52, in The Office of the Clerk of Superior Court of Glynn County, Georgia, as all of Lot 17, Ocean Cottages at Ocean Forest, Phase Six. Reference is hereby made to said plat and to the record thereof for further purposes of description and identification of said property and for all other purposes. Also included herein is an easement for the purposes of vehicular and pedestrian access, ingress and egress, over, through, and across the streets and lanes shown on the several plats of survey for the various phases of Ocean Forest, all recorded in said Clerk`s Office, including but not limited to the streets and lanes known as “Ocean Road,” “Forest Road,” and “Forest Lane”. 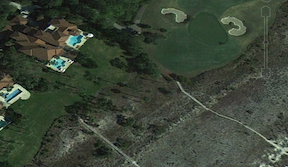 which has the property address of 801 Ocean Road, Sea Island, Georgia., together with all fixtures and other personal property conveyed by said deed. The sale will be held subject to any unpaid taxes, assessments, rights-of-way, easements, protective covenants or restrictions, liens, and other superior matters of record which may affect said property. The sale will be conducted subject (1) to confirmation that the sale is not prohibited under the U.S. Bankruptcy Code and (2) to final confirmation and audit of the status of the loan with the holder of the security deed. Notice has been given of intention to collect attorneys’ fees in accordance with the terms of the note secured by said deed. Said property will be sold as the property of VarnerFamily Holdings, LLC and the proceeds of said sale will be applied to the payment of said indebtedness, the expense of said sale, all as provided in said deed, and the undersigned will execute a deed to the purchaser as provided in the aforementioned Security Deed. TMST Home Loans, Inc. Attorney in Fact for John L Varner Anthony DeMarlo, Attorney/kgrant McCurdy & Candler, L.L.C. (404) 373-1612 www.mccurdycandler.com File No. 10-04675 /CONV THIS LAW FIRM IS ACTING AS A DEBT COLLECTOR AND IS ATTEMPTING TO COLLECT A DEBT. ANY INFORMATION OBTAINED WILL BE USED FOR THAT PURPOSE. But, it doesn’t tell all. It doesn’t tell that this residence, built on the edge of the ocean, ONE foot above sea level and on which some financial institution lent five million dollars in 2007, was most recently sold in 2012 for $2.9 million, an appraisal the tax assessor accepts and on which the new owners owe $28478.88 in taxes and for having their garbage collected. Of course, the nesting sites that were displaced by the arrival of the Varner Family in 2003 contributed no revenue to the county coffers. And that may well explain why our elected officials are complicit in this ruination of the landscape. 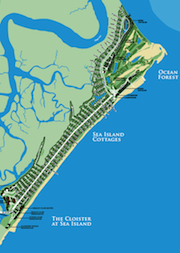 Given that the elevation on the north end of Sea Island ranges from one to nine feet above sea level, the sixteen foot dune on the Spit must look real attractive, if they can just sell off the lots to “sophisticated” buyers before the ocean carries them away. But, since the force main is more than two hundred feet away, current law doesn’t require connections from new development, unless the rules are changed and, so far, nobody’s paying attention to the underground. That OSDS are regulated by the Health Department, a state agency, while public sewers are a local government concern may well be part of the problem. While much data gets fed into computers, there’s apparently some interest in people not co-ordinating and not knowing what’s going on. How else did a Master Plan, for which consultants were paid good money, get laid on the shelf at a time when force mains and fire hydrants were being installed? Yes, the facilities are available, but who knew they’re not being used? It’s no wonder the marsh buffers are being disturbed. The leach fields have to go somewhere and taking out the mature oaks destroys the ambience of the place. Meanwhile, the marshes are considered valueless, except as a viewshed, and our tax assessors seem to agree. How else are the 1300 acres of marsh between Sea Island and St. Simons appraised at $600 and assessed $5.87 in tax? Hardly worth sending out the tax bill. Maybe what we need to get some attention is a moratorium on new building. Besides, money seems to be tight. Why else would Sea Island’s annual fees to the Secretary of State be in arrears? This entry was posted in another perspective, Economy and tagged Georgia, OSDS, Sea Island, Sewage, Water Pollution on March 1, 2014 by hannah.